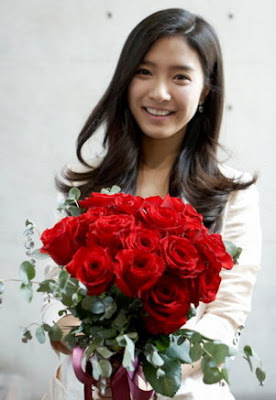 If you guys remember how cute Kim So Eun was as Ga Eul from Boys Over Flowers, you should get excited for this. This actress is set to star in a new daily drama A Good Day for the Wind to Blow. I’m kind of ecstatic for this one because I’m a huge fan and she is going to play the main character for once! Kim So Eun’s character, Kwon Oh Bok, dreams of being the best illustrator. She is poor and helpless but she has a big dream and is very determined. She will share a love triangle with a design company’s boss and a hometown oppa. This drama will also star Jin Lee Han, Seo Hyo Rim, Kang Ji Sub, Kim Mi Suk, Na Moon Hee and more. The drama is set to air in February. Korean actor Lee Min-ho is set to make a comeback to the small screen in April, according to television broadcaster MBC on Monday. The actor has been cast for the lead role in a new MBC TV series, tentatively titled "Personal Taste", which is based on a novel of the same title by Korean writer Lee Se-in. Lee will play the role of Jun Jin-ho, who pretends to be a gay man in order to become roommates with a woman who wants to live with a gay male friend. An MBC drama executive explained that Lee's combination of "a sophisticated image and the appeal of a man" was perfect for the part and for fulfilling female viewers' fantasies. He also added that Lee's "gripping dramatic presence and his shameless acting" will be convincing for the viewers. "I decided to do the drama as soon as I read the script", the actor was quoted as saying. The 22-year-old actor, who debuted in 2005, rose to stardom after starring in the smash hit "Boys Over Flowers" last year. The drama co-starred Korean actress Koo Hye-sun and idol group member Kim Hyun-joong of SS501. "Taste" is scheduled to air around April after "The Woman Who Still Wants To Marry" ends its run. The Grand Prizes each went to Lee Byung-hun for his work in "Iris'' (KBS), for "Jang Seo-heeCruel Temptation'' (SBS) and Ko Hyun-joung for "The Great Queen Seondeok'' (MBC). Year-end drama awards have been criticized for being too generous when giving out awards and also not meeting the public's consensus. Last year's events were indeed generous, yet there were no decisions that caused anyone to shake their heads. However, there were distinctive trends that made the three events different from the past. Unlike the pop industry where young idol bands are main stream, the older crowd is on top in the drama scene. Lee, Jang and Ko are all in their '30s, beating their younger colleagues with their charisma, experience and impeccable acting skills. Top prizes, including the Best Acting Awards, also went to actors and actresses in their thirties, including Chae Si-ra ("The Iron Empress,'' KBS), Yoon Sang-hyun ("My Wife is a Superwoman,'' MBC) and So Ji-sub ("Cain and Abel,'' SBS). Most of the dramas aired last year featured 30-something actors. Notable exceptions included hit drama "Boys Over Flowers,'' but many television series dealt with more mature characters who were caught up in love triangles and hip trends. Thanks to the superb acting, numerous dramas, such as "Style'' and "Cain and Abel'' managed to receive critical acclaim, even though they failed to mark high ratings. Last year saw numerous actresses bloom, thanks to dramas that depicted love and battles between the two sexes. Kim Tae-hee and Kim So-yeon also made a lasting impression for their tough and distinctive roles in the popular drama "Iris,'' and their work paid off with awards at the KBS Drama Awards. Kim Tae-hee, who has been continuously criticized for her poor acting throughout her career, thanked viewers in tears as she received the awards, while Kim So-yeon also cried as she thanked her loved ones. 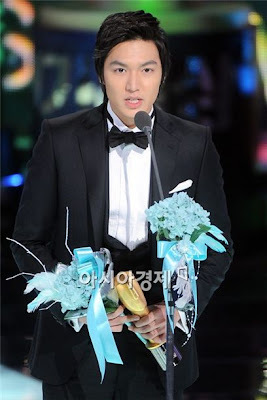 Dramas of 2009 also displayed numerous couples on the small screen, and of course awards were given to the best ones. MBC's Best Couple Award went to Lee Yo-won and Kim Nam-gil from "The Great Queen Seondeok," while SBS awarded singer-turned-actor Lee Seung-gi and Han Hyo-joo from "Brilliant Legacy.'' Lee and Kim's characters in the period drama failed to find happiness on the small screen, but their tragic love and affection toward each other moved the audience. KBS gave out awards to a number of couples: Lee Byung-heon and Kim Tae-hee ("Iris''), Yun Eun-hye and Yoon Sang-hyun ("My Fair Lady''), Ku Hye-sun and Lee Min-ho ("Boys Over Flowers''), and Lee Pil-mo and Yoo Seon ("My Too Perfect Sons''). The year 2009 has come to an end, and so has the excitement of last year's soaps. With high hopes and keen anticipation, the three major networks are expected to provide yet another exciting year, filled with talented actors, interesting storylines and catchy trends. "Who is your partner?" When you take a look at the definition of ‘Partner’, it gives you synonyms such as colleague, sharer, spouse, and accomplice. Partner is a person who is strongly associated with me; the one who knows me very well and stays by my side. The word ‘Partner’ takes a different meaning when it is used in law firm. Partners are the people who survived from the power struggle. They are executives who are on the top of the law firm pyramid. Enterprises are law firm’s partners. Law firms fight each other to become a partner of business. They struggle to be close to power and to become a slave of money. There are some lawyers who want be the partners of commoners as well. They are willing to be the spokesperson for the underprivileged. It is a story about partner; the one who is going to stay by your side and fight together in front of law. This year's lineup of dramas proved to be interesting. There were young, handsome characters attracting female fans ("Boys Over Flowers,'' KBS), smart housewives took over households and offices ("My Wife is a Superwoman,'' MBC) and ancient royalty ("The Great Queen Seondeok,'' MBC) and intelligence agents ("Iris,'' KBS) fought for their lives on the small screen. For 2010, networks are preparing another year of compelling dramas based on history, catchy storylines and even war. Three networks are traveling back in time, mostly to the Joseon era (1392-1910) for their 2010 lineups. SBS will air "Jejungwon,'' a stylish drama about the nation's first "modern" hospital during the Joseon Kingdom period. It will star Yeon Jung-hun, husband of actress Han Ka-in, as the rich and smart doctor Baek Do-yang, and movie star Park Yong-woo will appear as Joseon's first surgeon, Hwang Jung. Actress Han Hye-jin will star as Joseon's first female doctor. Historic records show that doctors at Jejungwon looked after many sick people, regardless of their economic status in the hierarchical Joseon society. "Jejungwon'' will begin airing Jan. 4 at 10 p.m. on SBS. KBS will present three different dramas based on the theme of noblesse oblige and present famous historical figures that spent their lives performing various services. The first of the three is "Myungga'' (working title), which presents the history of the Choi family, a famous household of 300 years ago based in Gyeongju, North Gyeongsang Province. "Myungga'' literally means a noble household. Starring Cha In-pyo and Han Go-eun, it will show the rules and discipline the Choi family had to go through during the turbulent Joseon Kingdom. The series will start airing Jan. 2 at 9:40 p.m. Following the 16-episode "Myungga'' will be "The Merchant, Kim Man-deok'' (working title), starring actress Lee Mi-yeon as a courageous merchant of the Joseon era. The drama will feature Lee as Kim Man-deok (1739-1812), who donated all her belonging to poor villagers living on Jeju Island. This is Lee's first drama in three years, and her first period drama in eight years since the hit series "The Last Empress'' on KBS. "The Merchant, Kim Man-deok'' will start airing on KBS in March. The final series of KBS' "noblesse oblige'' project will be about independence fighter Lee Hoe-young (1867-1932). When Japanese invaded Korea, Lee donated all of his savings and moved to China to build a school. He trained soldiers and scholars who later led the army to win numerous battles during the early 20th century. He died in prison after being captured and tortured by the Japanese army. Further details regarding the series are to be confirmed soon. MBC will bring back producer Lee Byung-hun ― the maker of hit television series including "Jewels in the Palace,'' "Heo Jun,'' "Prince of the Legend'' and "Lee San, Wind of the Palace'' ― to offer "Dongi' (working title) in March. The new drama will present the story of King Sukjong (1661-1720) of the Joseon Kingdom and Sukbin Choi, one of his consorts. Choi later gave birth to King Youngjo (1694-1776). 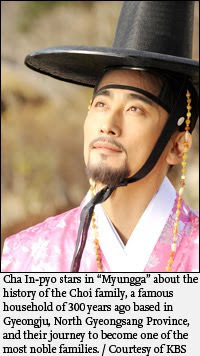 Actor Ji Jin-hee, who also starred in "Jewel in the Palace,'' will appear as King Sukjong. Han Hyo-joo, the young heroine of popular drama "Brilliant Legacy'' (SBS), will play the part of Choi. Meanwhile, KBS will follow "Iris" with "Chuno," a show about house servants referred to as "chuno." The drama will star Jang Hyuk as slave hunter Lee Dae-gil and Oh Ji-ho as the slave Song Tae-ha. "Chuno'' begins airing Jan. 6 at 9:55 p.m. on KBS. MBC is continuing with its successful streak of culinary dramas with "Pasta," following "Jewel in the Palace'' (2003), "My Lovely Sam-soon'' (2005) and "Coffee Prince'' (2007). The story revolves around aspiring female chef Seo Yu-gyeong, played by model-turned actress Kong Hyo-jin. The series will follow the relationships between Seo, chef Choi Hyun-wook (Lee Sun-kyun) and sous chef Geum Suk-ho (Lee Hyung-chul), and also give an inside view of a kitchen and the making of Italian dishes. "Pasta'' will start airing Jan. 4 at 10 p.m.
Actress Moon Geun-young returns to the small screen as an evil sibling in the upcoming drama "Cinderella's Sister'' (working title). This will be the first evil role for the 22-year-old, who is famous for her innocent image. "Cinderella's Sister'' is scheduled to air in March. KBS will air a Japanese manga-based drama called "Master of Study," which is based on "Dragon Zakura'' by Norifusa Mita. It's the story of a young boy and his friends who learn the importance of studying and friendship as they prepare for the university entrance exam. Funny man Kim Su-ro will appear for the first time in a television series as a charismatic and headstrong teacher, while boy-next-door Yoo Seung-ho will star as the stubborn yet charming Hwang Bek-hyun. The soap will start airing Jan. 4 at 10 p.m. The year 2010 marks the 60th anniversary of the outbreak of the Korean War (1950-1953), so it's fitting that there will be a couple of dramas depicting the war. Heartthrob So Ji-sub will star in MBC's "Road No. 1,'' a drama about the survival of two young soldiers. Along with So, movie star Kim Ha-neul will return to the small screen as a military doctor. The title refers the main road that connected South and North Korea during the war. "Road No. 1'' is scheduled to air in June. KBS is working on "Jeonwoo'' (working title), which means comrade. It's a remake of a popular television series in the 1970s, and the state-run network will upgrade the drama into a series depicting the war and its aftermath. Details on the project will be confirmed soon.